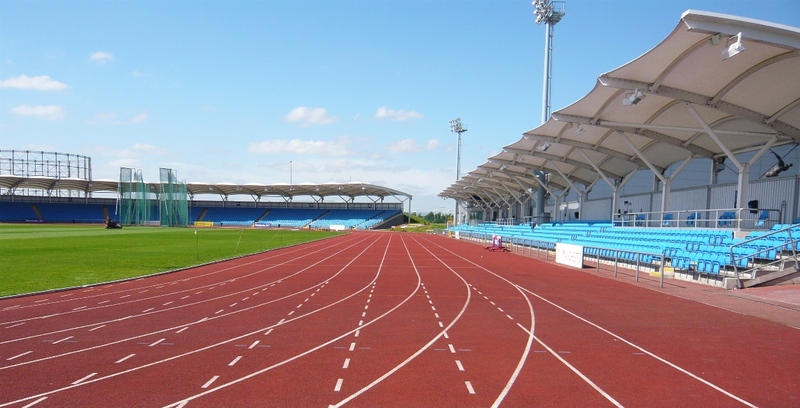 Belle Vue Racers are based at the Sportcity complex, Rowsley Street, Manchester M11 3FF. We meet on Tuesdays for a road session and Thursdays on the track. Everyone is welcome to both our sessions, from complete novices to elite runners. Coaches work together as a team to ensure everyone gets the most out of sessions. For Thursday’s track session, we meet at 18:45 inside the Sportcity complex (‘National Squash Centre’), ready to start the session at 19:00. Entrance to Sportcity is £2.20 for Manchester residents (£2.40 for those living outside Manchester) and club fees per night are £1. Event quality changing facilities and showers are available. There is some parking although, at busy times, it can be difficult to find a spot. We are no longer able to use the spaces surrounding the Etihad Stadium. As an alternative therefore, if you carry on Alan Turing Way – with ASDA on your right – to the lights by the Gasometer, turning left here will lead you to a large car park linked to the Manchester Regional Tennis Centre. From here it is only a short jog to the track. Meet at 18:45 at Heaton Mersey Bowl, Didsbury Road, Heaton Mersey, Stockport SK4 3EX. We meet at the black wooden sign with Heaton Mersey Bowl written on it at the junction of Didsbury Road and Station Road. Plenty of on street parking is available. Tuesday sessions are led by Frank Rogers. Club fees per night are £1. Sessions will be a mixture of endurance training, assisted running, interval running, hill reps, embankments with endurance training or speed work dependent upon training load for the week.